What are some of the reasons for stopping? In his book (which I recommend) on writing, IMMEDIATE FICTION, Jerry Cleaver makes the case for conflict and continually raising the stakes: “Happy lives make lousy novels…. If the characters are having a good time, the reader is not.” What if, on the other hand, it’s about you and not the page? 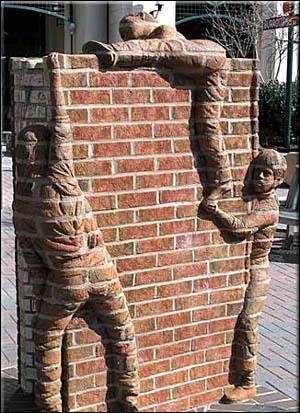 There are some problems that can cause you to hit the wall, creatively speaking. Things like myopia when it comes to the work, being totally rule-bound (though please know the rules before you begin breaking them), forgetting to play, concentrating too hard on the outcome you want, fear, difficulty taking risks, lack of perspective, not listening to other opinions, worrying too much what others will think, and writing for the entire world. Newsflash, you can’t please everyone. Open up your process and let it breath. Have a good time. Get to your point. Have a reader in mind and write to them. Go out and play once in awhile. The solutions for you as a writer are remembering your playfulness, striking that balance between what you want to say and getting helpful input from others, clarity, resourcefulness, research, persistence, flexibility and a willingness to go with your strengths while developing your weaknesses. If story isn’t your strong suit, do some writing exercises that focus only on the story. Honing your pitch would be one of them. The National Storytellers Network has lots of resources. There are more here. Visit Toastmasters. Yes, Toastmasters – tell a story to a room full of people. Write a play. Take an acting class. Get out of your comfort zone and improve your writing. Can you play through pain? Are you stuck because it’s just too difficult? Marathoners (and for the record, that in no way describes me – blew out my knee playing soccer when I was a teen) talk about hitting the wall around mile 22 (26.2 miles in a marathon). There are plenty of sites and books to tell you how to prepare for the wall, but if you’re going to compete physically at a certain level – if you are serious about it – you learn to play (or run) through pain. In a sense, the same is true for writing. You have to learn to write no matter how you’re feeling (within reason – time off for major life events). In other words, it does not matter if the subject matter is uncomfortable psychologically or if you think the first three chapters stink or (whine, whine) you just don’t feeell like writing today, keep at it. When I talk to other novelists about it, our mile 22 is usually in act 2 (what is it with the number 2?) The fun and agony of it is that no one can save you, the writer, in Act 2. You have to find your own way out. Steven Pressfield and the always-opinionated David Mamet have been there and written about it. More on getting unstuck by Michael Bungay Stanier. Now that you are, go write!